A wedding planning checklist is an important tool for the main reason that it keeps you from forgetting any important parts of a perfect ceremony. I got a big binder and bought a box of plastic protector sheets. Believe it or not this was the best organizer ever! I put pics of cakes I liked, clothing, dresses, decor, seating plan, everything in the clear sheets in my book and it was easy to change pages as needed! and the pictures make a great keepsake. Start interviewing photographers and videographers if you want a video, dont scrimp on these, these are irreplaceable memories. If you feel overwhelmed and lost, you can always hire a planner or get a package from a reputable venue that does everything for you! Download Free Planning Checklist Now! Buying a wedding planning checklist book can be a great source of marking things off as you go. 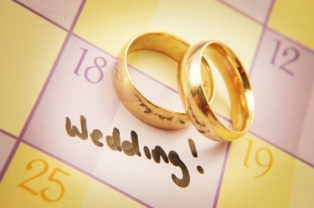 Return to Weddings in Las Vegas from "Wedding Planning Checklist".